The ever popular "Tacoma" plan (currently under construction) including the West Indies elevation and will impress the fussiest buyer. 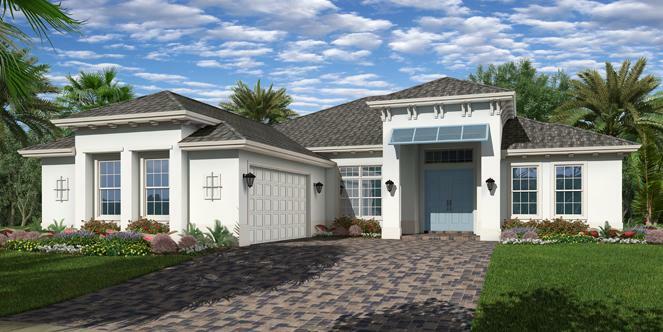 Located in Lake Sapphire, a natural gas community in the heart of Vero Beach. This home will be move in ready Summer 2019. Great open layout with both formal and informal dining. Some of the outstanding features including tankless gas water heater, spray foam attic insulation, double impact entry doors with 3/4 cord glass, 8' solid core interior doors, home wired security system, and wood floor pattern tile flooring. The gourmet kitchen presents large central island, granite counter tops, 36" gas cooktop, stainless steel vented hood, steam dishwasher, wall oven including convention/microwave and under cabinet lighting. This home also offers private pool, travertine pavers and screen enclosure. Call Lisa Krynski for additional information 772-521-0954. Coming Summer 2019! Great family home.